The college debt crisis is one of the greatest injustices in American history, ranking right up there with the Native American genocide, slavery, and the Vietnam war. The best thing that you can do is refuse to participate, and stand up for your right to an education AND a livelihood by refusing to take loans for college. FACT: The easy availability of college loans drives up tuition prices. Just like housing bubbles are perennially fueled by decreasing federal interest rates, an increase in the availability of credit in any market drives prices up. 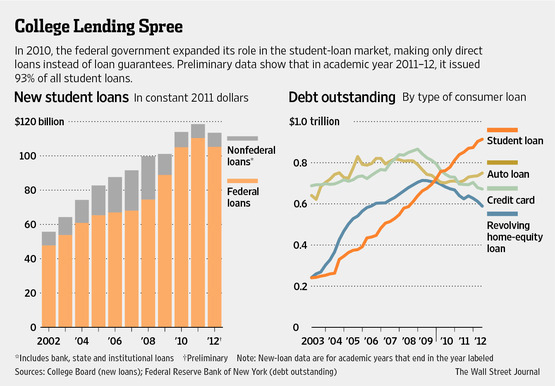 Why are more students taking bigger loans to go to college? Because prices are increasing. Why are prices increasing? Because more students are taking bigger loans. FACT: College cost increases have exceeded cost-of-living increases and median wage increases. Why do colleges charge more for tuition? For the same reason that oil cartels continuously raise prices and gas stations gouge consumers at the pump. Because they can. A college degree is not a shoo-in for a job. At the same time that college costs have been skyrocketing, the number of jobs available has been shrinking, and the number of opportunities to create a rewarding career from scratch has been increasing. The go-to-college-get-a-job career plan isn’t the only game in town, even when it is possible. Parents of high school age kids today grew up in a world where having a college degree meant having a better-than-average shot at a high-paying job, and not having one meant a lifetime toiling at a payscale tied to the minimum wage. Parents don’t always realize that times have changed, and may think that because going to college, and taking loans if necessary, made sense for them, it makes sense for their kids too. But the future does not equal the past. Education should be a right, not a luxury. Education is the foundation of an economy, and the basis of the pursuit of happiness. Make no mistake – debt is indentured servitude. It means that the money you earn does not belong to you. The looming college debt crisis threatens to create an entire generation of debt-locked peasants. Let’s face it: the United States spends more money on weapons of mass destruction than any country in the world, and more money on surveiling and incarcerating its citizens than it does on educating and caring for them. Increasing militarization and decreasing education does not a recipe for a bright and prosperous future make. If the United States wants to avoid obliterating itself back to the dark ages, it needs to recognize these truths as self-evident. Beyond resisting the pressure to take college loans, what can you do? You can figure out how to pay for college without taking loans. Or, you can skip college altogether and get right down to creating the life of your dreams.